Hello all my friends on ThrillNetwork, it’s been a while since I actually sat down to write out something personal rather than about a new coaster, ride, etc. It’s high time I did though. As some of you may remember, I started a thread called The Quest (no relation to the new TV show). The Quest was all about my weight loss struggles, a place for fellow enthusiasts to discuss their struggles as well, and so on. Being an American, I’m totally in the majority of people these days that are overweight. Our blessings have become our curse in so many ways in this country. Most people don’t struggle to survive in the true sense. Most people have 3 meals a day, or at the least 1-2 meals a day. There are many places in the world where people don’t even get 1 meal a day every day. But this isn’t a social activism call, this is about weight loss and how it relates to our shared hobby of amusement parks and coasters. I started The Quest in January of 2005; on I’m sure another New Year’s resolution to lose weight during the year, yet again. Resolutions aren’t a bad thing, but like many people I never seem to stick to them long enough to see the calendar change to February.. In 2010, I had the opportunity to do a madcap weekend in Pennsylvania and New Jersey. New Jersey ironically would become my 16th state in the Union for me to visit. Some would make a joke that my Sweet 16 wasn’t very sweet, but I disagree. At least the part of it I saw wasn’t so bad. Met a few nice folks there including TN’s own Leo… but I’ll get to that here soon. My 2010 weekend included first trips to Dorney Park, HersheyPark and finally a park I had dreamed of visiting for years, Six Flags Great Adventure in Jackson, NJ. I honestly don’t know what my weight was that weekend, but I was at least heavier, if not heavier than I am now and that created some anxiety. 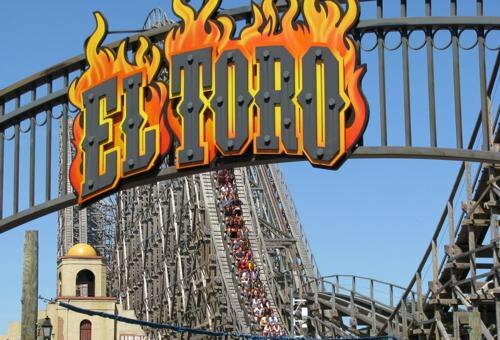 You see, there’s a little roller coaster called El Toro, and just recently it was voted yet again the #1 wooden coaster in the world! The problem is this: El Toro has a very confined restraint system and for good reason. The coaster has such strong g forces that if not properly restraint, a rider would surely go flying off the coaster. The restraints being so restrictive gave me pause about even going on the trip, but I decided that you only live once, and therefore I went for it. Now back to Leo: He was my guide for his home park, and what a home park he has! I really, really loved Nitro and Bizarro. Bizarro would become my favorite floorless, and Nitro my new #1 steel coaster! Sorry Carowinds fans, Intimidator dropped to #2. Great Adventure really shocked me how nice it was, especially being a Six Flags. There were unique themes, rides and scenery that I had never seen in any of the other 4 Six Flags parks I had visited. I could see now why so many people raved about the park. After entering the park, we headed to Superman: Ultimate Flight to get that line out of the way early in the day. It was a fairly long line, but not as bad as some I’ve waited in at Superman located at Six Flags Over Georgia. Having ridden with the Man of Steel, I set my eyes next on the tallest (and at that time) fastest coaster on the planet: Kingda Ka. Living up to its reputation, the coaster experienced some down time as I was entering the station. Leo and I waited it out, and finally I got my ride in. I wasn’t very impressed, as I took the shortest line which was on row 5 or 6 which rattled really badly. I’d like to try the coaster again one day closer to the front of the train. But time and other things prevented me from riding again that day. On to the real reason I had driven to the state of New Jersey, El Toro. As we approached the ride, I was very surprised to see a short line. It was a Sunday, but I still expected very long lines for the coaster. The park does provide a test seat, and we tested and we tested and we tested. Leo tried with all his might to get a green light, meaning that I was thin enough to fit on the coaster, but to no avail. Having traveled hundreds of miles to ride this coaster though, I wasn’t so easily dissuaded. With a lump in my throat, and fear in my heart that I was about to be denied the ride, I headed for the station. After a short wait, I sat down in my seat. I worked a little but got the seat belt on. Maybe this would turn out better than expected. I held my breath and pulled down the restraint. It was locked! Then I saw the look on the face of the ride attendant and her look back at the driver (the person seated in the control booth that does the final release of the train) and he gave her a nod in the negative, my bar wasn’t far enough down even though it was locked. I asked her if she would help me, and she told me she couldn’t. Which frustrated me as you can imagine, because I’m used to my home park Carowinds which will try everything in their power to help a guest (safely) on a coaster or ride. She told me she couldn’t push with any force at all, and asked me to leave (basically). Yet another walk of shame. I knew this was a real possibility; I knew it and still took the chance on driving to Jersey to try the coaster out. But you see that wasn’t the end of the story. Many times a huge disappointment in life can be the start of something big. President Lincoln failed many, many times in politics before he was inaugurated president. Jump forward to spring of 2013. It seemed that I was finally on the verge of breaking through my cycle of weight loss and gaining it back, then vertigo hit. No, not the movie, the condition which pretty much stopped me cold in my tracks for well over a month. After the vertigo finally left me, every bit of momentum that I had seemed to have left me and my body refused to get back in the groove of things and start losing weight again. What seemed like yet another trip around the same mountain may have been the setup for possibly my best year, in years. In December while flipping channels, I ran across a British documentary about something called the 5:2 diet. I won’t go into great detail here, you can find a lot of information online, but I’ll just say it involves fasting from a majority of your normal calories 2 days a week, and then eating normally 5 days a week. As I sit here typing, in jeans I wouldn’t exactly call comfortable a few months ago, I’m down almost 15lbs since the first of December and down 2 sizes in my blue jeans. I feel better than I have in years, working out stronger than I have in years and as a real plus, I’m actually starting to not mind looking at myself in the mirror again for the first time in a while. I’m not talking about being vain, but for many years I just ignored mirrors at all cost because I frankly hated to see myself in the mirror. I’m not there yet, and I still have a long way before I’ll say I’m happy with my weight on the scale, but I’m trying to be content and happy along the journey Weight loss is not a quick fix for most people; it is a journey that takes time, effort and courage to never give up. With many Americans, and the rest of the developed world struggling with their waistlines, we are all going to have to dig in and find something that works for us as a people. The same program won’t work for everyone. People have called me crazy for fasting in any form or fashion, but it works for me. Find what works for you! As I said, I haven’t attained my goal weight yet… but I will one day. And when I have, you better believe I will be booking a trip back to the Jersey Shore to conquer El Toro. Ole!